This is another wonderful book by Joanna Weaver. I just love her writing style - she is so easy to read! Her transparency is refreshing! This book has been a wonderful source of encouragement and conviction. Joanna starts off the book with a very serious prayers asking God to change us to be more like Him. And that is exactly her goal as you read the pages you can tell that the prayer of her heart is to help others become more like Christ. In order to be more like Christ we must be changed from the inside. Deep inside. Things must be faced that we have repressed and stuffed deep down, thinking we would never have to deal with them again. Once we start to change the hidden places of our heart our actions follow. People can't help but see Christ in our lives. I highly recommend this book as a great resource for those who are seeking a closer walk with God. In my opinion this book is best read before her first book. Once you have taken care of your heart you are more likely to have the desire for the living room intimacy she speaks of in her first book, Having a Mary Heart in a Martha World. "Lord whatever it takes, make me like You!" You long to serve God with grace and strength, to reflect Christ in every word and action. Yet you find yourself continually struggling to bring that vision to life in your daily walk. At our very core, every one of us is a 'twisted sister' within whom the flesh and spirit battle constantly for control. We are afflicted with spiritual schizophrenia, the disconnect between our good-girl desire to put Jesus first and our bad-girl realities that crowd our thoughts and push him out of the way. 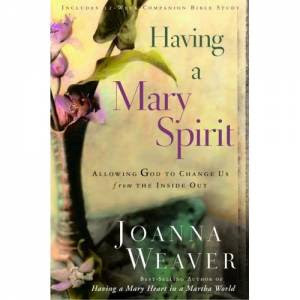 In this life-changing book, Joanna Weaver, author of the perennial bestseller, Having a Mary Heart in a Martha World, directs your gaze past your own shortcomings to the God who stands ready, willing, and able to make a new woman out of you. She equips you with biblical insights and practical tools to partner with Christ, inviting him into the hidden places of your soul and giving him full permission to redeem and renovate. Drawing on the stories of the biblical Mary's (Mary, mother of Jesus; Mary, sister of Martha; Mary Magdalene) and others whose experience with God transformed their lives, Joanna shows you how you can find what you long for: hope, healing, wholeness, and joy. Having a Mary Spirit will launch you toward lasting personal transformation: soul-deep change that results in a complete makeover - from the inside out.